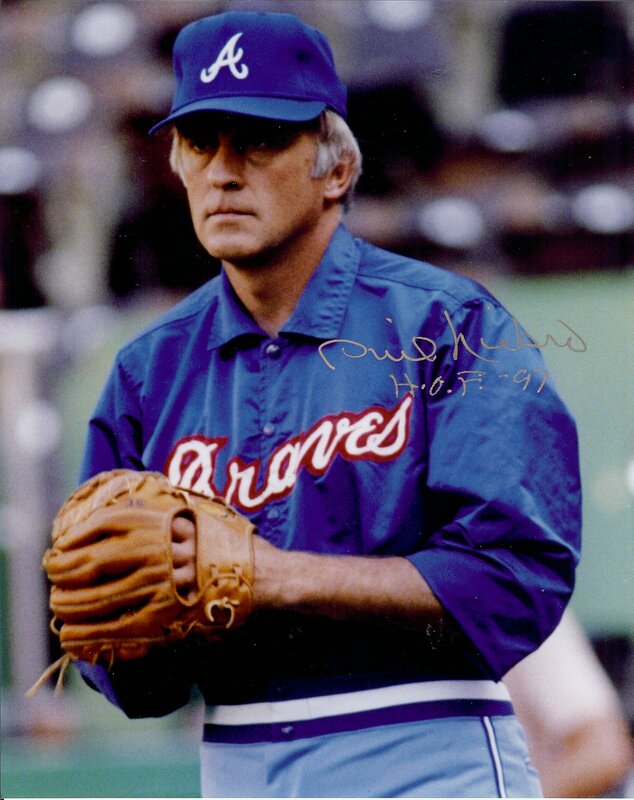 Phil Niekro was one of the more colorful characters in baseball. His career spanned 23-years, playing for five different teams. 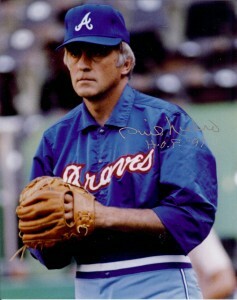 The majority of his career was spent with the Milwaukee/Atlanta Braves from 1964 to 1983. When he retired at the conclusion of the 1987 season, Niekro had racked up 318 career wins, 3,342 strikeouts and a 3.35 ERA. 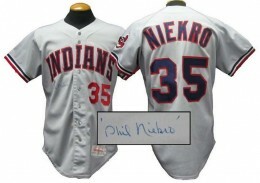 Despite these Hall of Fame numbers, Phil Niekro cards are very affordable. 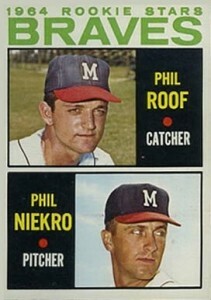 Niekro's rookie card is from the 1964 Topp Baseball set. He shares the card with fellow Braves rookie, catcher, Phil Roof. Niekro also has one pre-rookie card. It was issued in 1962 by Jay Publishing. His first certified autograph card is from the 1993 Nabisco All-Stars set. Upper Deck produced his first autographed card by a trading card manufacturer in 2000 Upper Deck Legends. The card is not serial numbered, although a Gold parallel is numbered to 50. Niekro's first memorabilia cards entered the market in 2001 Leaf Certified Materials and 2001 Upper Deck Legends of New York. In addition to a game-used jersey card in Legends of New York, Niekro also has an autographed memorabilia card that has a print run of 195. Phil Niekro's autographed memorabilia is very affordable for a 300-win pitcher. 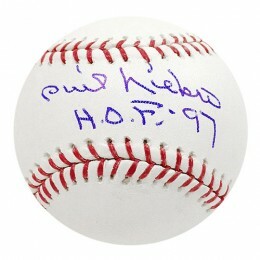 He has been a frequent participant in regional and national sports collectibles conventions. Signed baseballs are usually the preferred piece of memorabilia collectors pursue. The card back features an orange color that is prone to showing edge and corner wear. This is unfortunate because it can often drop the value of the card considerably. This is true even if the front of the card looks perfect or nearly perfect. *Nice!! * 1977 Topps PHIL NIEKRO #615 PSA 7 - NEAR-MINT! Hall of Famer!! 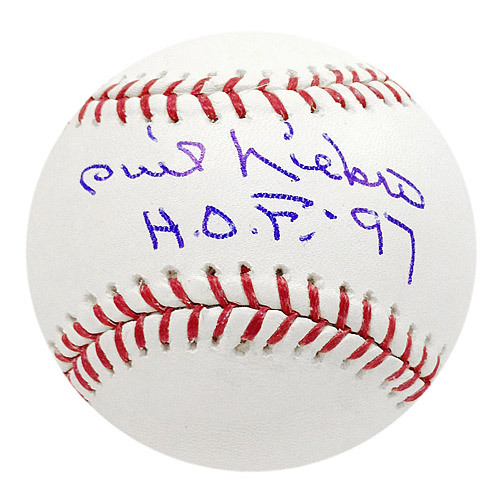 Below you will find an example of what Phil Niekro's authentic signature looks like. This can be used as a first point of reference for determining the legitimacy of autograph memorabilia, but is not a substitute for having your items authenticated by a well-respected professional autograph authentication company. Some of the trusted sources within the sports memorabilia market include the following companies: PSA, JSA, Steiner, Mounted Memories and Tristar. Click on any of the images below to view full size photos. It is a very easy autograph to discern on a letter-by-letter basis. The "P" is not always closed and usually shows a short vertical line. The"h" resembles more of a "u." The "l" is short and contains an open loop. The "N" can vary in how it is rounded, or not, in the hump. The "i" is again dotted. The "e" is very small but does display a small opening. The "k" resembles a 'b." The "r" resembles a "i' without a dot. The "o" is a small flair that comes off the top at a slight angle.